Chris Johnson is an attorney at Waters Kraus & Paul in the firm’s Dallas office. Chris represents plaintiffs involved in toxic tort and complex civil matters. He focuses on helping victims who have been catastrophically injured by dangerous products and toxic substances, including people dealing with mesothelioma resulting from asbestos exposure. Chris earned his bachelor’s degree, with honors, from the University of Texas at Austin. He was awarded his Juris Doctor degree from Southern Methodist University, Dedman School of Law. Chris served as the editor of the SMU International Law Review and was a Dean’s Scholar throughout law school. After law school, Chris was named Prosecutor of the Year in the Misdemeanor Division for the Dallas County District Attorney’s Office. He has taught as an affiliate professor at the University of North Texas at Dallas College of Law, where he also contributed his time mentoring first-year law students through the school’s Bedford Mentor program. Chris formerly served on the Board of Management for the T. Boone Pickens YMCA. 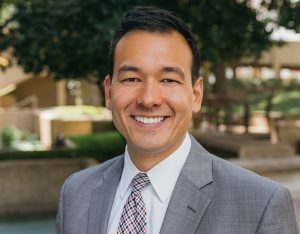 He is currently a member of the American Association for Justice, Dallas Asian American Bar Association, Dallas Association of Young Lawyers, and the Dallas Bar Association. Chris has been selected for recognition on the 2018 Super Lawyers Texas Rising Stars list, published by Thomson Reuters. He is an AV® Preeminent™ ranked lawyer with a peer review rating of 5.0 out of 5.0, ranking and peer review surveys are conducted by Martindale-Hubbell. Chris is licensed to practice law by the State Bars of Oregon and Texas.